(Nanowerk News) According to FAO estimates, by 2025 nearly 2 billion people may not have enough drinking water to satisfy their daily needs. One of the possible solutions to this problem is desalination, namely treating seawater to make it drinkable. However, removing salt from seawater requires 10 to 1000 times more energy than traditional methods of freshwater supply, namely pumping water from rivers or wells. Motivated by this problem, a team of engineers from the Department of Energy of Politecnico di Torino has devised a new prototype to desalinate seawater in a sustainable and low-cost way, using solar energy more efficiently. Compared to previous solutions, the developed technology is in fact able to double the amount of water produced at given solar energy, and it may be subject to further efficiency improvement in the near future. The group of young researchers who recently published these results in Nature Sustainability ("Passive solar high-yield seawater desalination by modular and low-cost distillation") is composed of Eliodoro Chiavazzo, Matteo Morciano, Francesca Viglino, Matteo Fasano and Pietro Asinari (Multi-Scale Modeling Lab). The working principle of the proposed technology is very simple: "Inspired by plants, which transport water from roots to leaves by capillarity and transpiration, our floating device is able to collect seawater using a low-cost porous material, thus avoiding the use of expensive and cumbersome pumps. The collected seawater is then heated up by solar energy, which sustains the separation of salt from the evaporating water. This process can be facilitated by membranes inserted between contaminated and drinking water to avoid their mixing, similarly to some plants able to survive in marine environments (for example the mangroves)", explain Matteo Fasano and Matteo Morciano. While conventional 'active' desalination technologies need costly mechanical or electrical components (such as pumps and/or control systems) and require specialized technicians for installation and maintenance, the desalination approach proposed by the team at Politecnico di Torino is based on spontaneous processes occurring without the aid of ancillary machinery and can, therefore, be referred to as 'passive' technology. All this makes the device inherently inexpensive and simple to install and repair. The latter features are particularly attractive in coastal regions that are suffering from a chronic shortage of drinking water and are not yet reached by centralized infrastructures and investments. Up to now, a well-known disadvantage of 'passive' technologies for desalination has been the low energy efficiency as compared to 'active' ones. Researchers at Politecnico di Torino have faced this obstacle with creativity: "While previous studies focused on how to maximize the solar energy absorption, we have shifted the attention to a more efficient management of the absorbed solar thermal energy. In this way, we have been able to reach record values of productivity up to 20 litres per day of drinking water per square meter exposed to the Sun. The reason behind the performance increase is the 'recycling' of solar heat in several cascade evaporation processes, in line with the philosophy of 'doing more, with less'. Technologies based on this process are typically called 'multi-effect', and here we provide the first evidence that this strategy can be very effective for 'passive' desalination technologies as well". 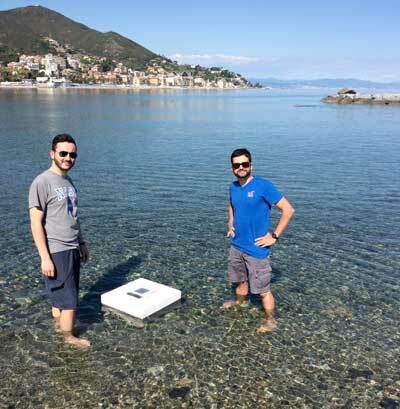 After developing the prototype for more than two years and testing it directly in the Ligurian sea (Varazze, Italy), the Politecnico's engineers claim that this technology could have an impact in isolated coastal locations with little drinking water but abundant solar energy, especially in developing countries. Furthermore, the technology is particularly suitable for providing safe and low-cost drinking water in emergency conditions, for example in areas hit by floods or tsunamis and left isolated for days or weeks from electricity grid and aqueduct. A further application envisioned for this technology are floating gardens for food production, an interesting option especially in overpopulated areas. The researchers, who continue to work on this issue within the Clean Water Center at Politecnico di Torino, are now looking for possible industrial partners to make the prototype more durable, scalable and versatile. For example, engineered versions of the device could be employed in coastal areas where over-exploitation of groundwater causes the intrusion of saline water into freshwater aquifers (a particularly serious problem in some areas of Southern Italy), or could treat waters polluted by industrial or mining plants.